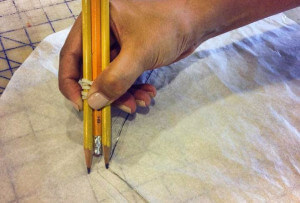 Sewing hacks are the little tips and tricks you pick up along your sewing journey. You’ll learn some sewing tips from the other, more experienced sewers you meet along the way. And, over time, you’ll even discover and share a few sewing tricks of your own. 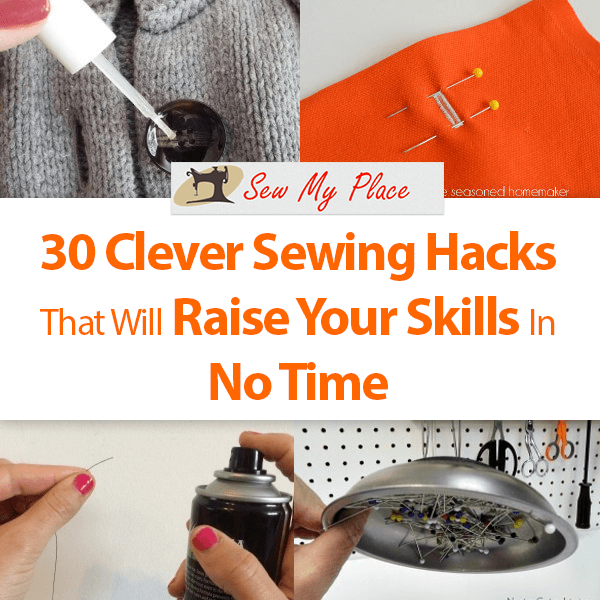 Here are 30 quick and easy sewing hacks that will make different aspects of the sewing process a whole lot easier. 1. Tired of your bobbins being a tangled mess? 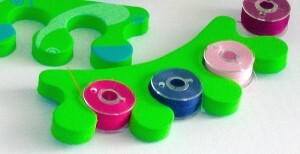 Use toe separators (the kind you find in pedicure kits) to keep your bobbins separated, organized and easy to find. 2. 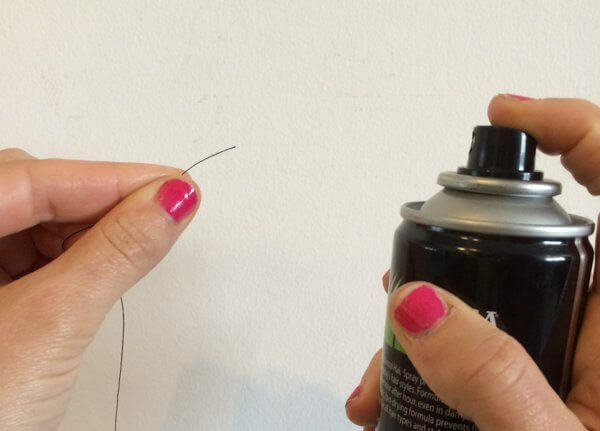 If you’re having a hard time threading a needle, spray the tip of the thread with hairspray. The stiffened thread will be much easier to get through the eye of the needle. 3. You usually get more for your money when you buy larger spools of thread. But if a large spool is too big for your sewing machine, just put a wide mug next to the machine, and set the spool of thread inside the mug. 4. When sewing with a delicate thread, you can prevent breakage by threading the needle with a second, sturdier thread. As you sew, the sturdy thread will support the more fragile thread and keep it from breaking. 5. 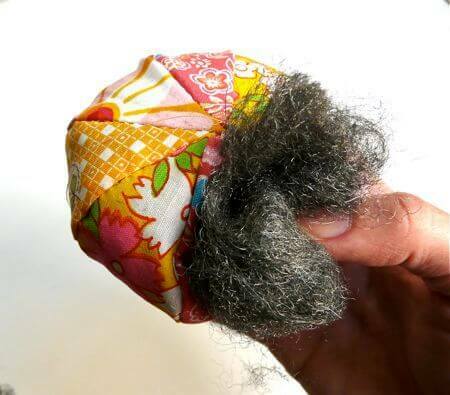 Do you have trouble getting pins through thick layers of fabric? 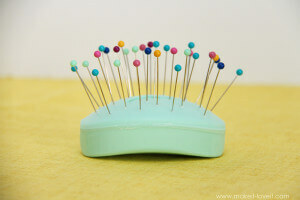 Then start using a bar of soap as a pin “cushion.” The soap will lubricate the pins, so you can pin thick layers of fabric together more easily. 6. 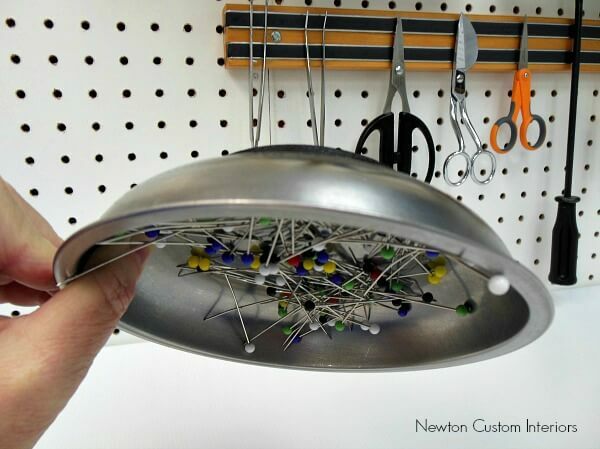 Here’s a simple way to keep your pins from getting dull. Make a pin cushion using steel wool as the stuffing. When you push your pins into the pin cushion, the steel wool will sharpen them. 7. If you’ve ever knocked over a bowl of pins, you know what a mess that can be. To prevent future mishaps, glue a magnet to the bottom of a bowl. Now, the pins won’t come spilling out if the bowl gets turned over. 8. Don’t try to pick up piles of sharp, metallic pins with your bare, vulnerable hands. Use a magnet instead. Just pass the magnet over the pile, and you’ll have those pins picked up in no time. 9. 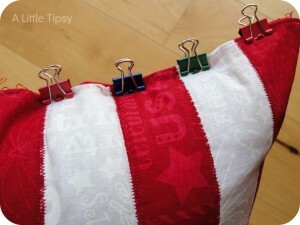 If you don’t feel like using pins to secure your fabric for sewing, use binder clips instead. Not only is it faster and easier, but binder clips won’t leave holes in the fabric the way pins can. 10. Many modern sewing machines come with lights to help you see while you’re sewing. But, sometimes, those lights just aren’t bright enough. One solution is to clip or tape a reading light to your sewing machine. Pick a reading light that’s easy to adjust, so you can position the light wherever you need it the most. 11. Does the foot pedal on your sewing machine like to wander around while you’re sewing? Put a piece of rubber cabinet lining under the foot pedal to keep it from moving around. 12. Want that button you just sewed on to stay sewn on for as long as possible? 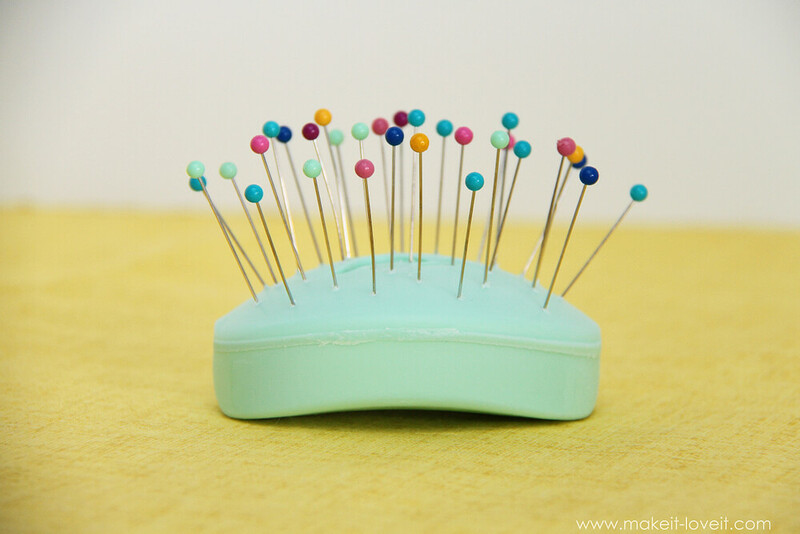 Brush a layer of clear fingernail polish over the top of the button to hold the thread in place. 13. You can use bias tap to “hem” pants and skirts. It’s fast, easy, and no one ever has to know. 14. Love to quilt, but don’t like spending money on batting? Think about using old blankets as “free” quilt batting. 15. Ironing between buttons and other embellishments can be tough. Luckily, you can use a flat iron (the kind used on hair) to press fabric in areas that might be hard to reach with a normal iron. 16. Attach a tape measure to the edge of your sewing table. This way, you’ll always have a convenient way to measure fabrics, even when you can’t find your ruler. 17. Here’s an easy way to create a seam allowance. Put two pencils together, and use a rubber band to secure them. 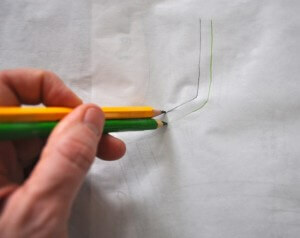 Now, as you trace the edge of your pattern with one pencil, the other will be drawing the seam allowance. 18. For a wider seam allowance, use a rubber band to put three pencils together. And don’t forget to push the middle pencil up a bit, so that it won’t make a mark. 19. To make a seam allowance guide on your sewing machine, wrap a rubber band around the base of the machine. You can adjust the width of the seam allowance by moving the rubber band closer to, or further away from, the presser foot. 20. You don’t need a bodkin to pull a piece of elastic or cording through a waistband. Pinning a safety pin to the end of the elastic or cord will do the job just as well. 21. 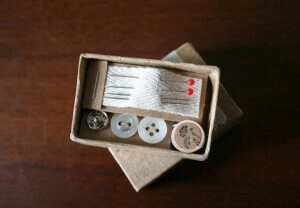 Do you want to carry emergency sewing supplies in your purse or pocket? 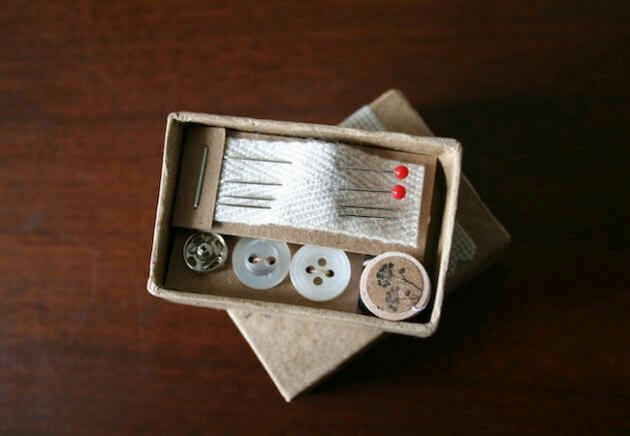 Well, a match box is big enough to hold some needles, thread, and even a few buttons. 22. To prevent fraying, use pinking shears to cut your fabric. 23. Slippery fabrics, like satin, can be hard to cut. To make things easier, pin a piece of muslin to the fabric before you start cutting. 24. 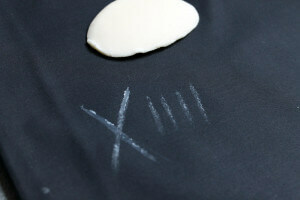 If you need to trace lines on your fabric, but can’t find your chalk, use a bar of soap. Don’t worry. The soap will come off in the wash.
25. Afraid your buttonhole will rip open more than you want it too? Well, you can prevent ripping by putting pins at the top and bottom of the buttonhole. 26. Lumpy fabrics, like fleece, can be hard to sew. Placing a plastic freezer bag on top of the fabric will make it pass under the presser foot more easily. And, once you’re finished sewing, you can gently tear off the bag. 27. Never lose track of your scissors again. Tie a long piece of ribbon around one of the handles, and then loop the ribbon around your neck. This way, you’ll always know where your scissors are. 28. 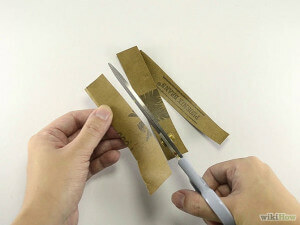 If your scissors have gotten dull, using them to cut a piece of sandpaper or tin foil will sharpen them right up. 29. Pattern weights allow you to cut more accurately than pinning alone. But pattern weights can be pretty pricey. Luckily, there are plenty of alternatives, including nuts, bolts, washers, flat pebbles, and even spare change. 30. Loose beads can be hard to handle. To make them easier to deal with, place a few pieces of masking tape, face up, on something like a paper plate. Pour the beads on the plate, give them a gentle press, and you don’t have to worry about cleaning up loose beads. I can not picture things in my mind. I just found out on the net, of course, that I am one of 2% of people. We also have no imagination. Now I know why I need a pattern to make anything. I have been looking for a place to make the holes for almost 3 hours when I ran across your website. I will understand if you can not help me.